Detoxing the liver is a popular pastime among adherents of alternative medicine and followers of a healthy lifestyle, but the concept has no basis in scientific fact. Your body has a natural detoxification system that involves your liver, kidneys and sweat glands. It is not possible to increase liver detox speed or efficiency; your body simply does not work that way. But, oranges are high in vitamin C, which is a proven antioxidant. Oranges are low in calories and contain dietary fiber, so even if they won’t detox your liver, they are still good for you. The idea that eating or drinking certain foods can forcibly flush toxins from your system has been around for centuries, but it has never been proven. Toxins are naturally processed, rendered harmless and flushed away by your body. In certain cases, such as heavy metal toxicity, alcohol and drugs, your body has to work a little harder. But even in those cases, you cannot speed up the process. Your liver is a gland that cleanses bacteria from your blood, metabolizes cholesterol and fat, filters urine and detoxes your body. The best way to ensure the health of your liver is to not ingest things that will make it overwork, like alcohol and junk foods laden with chemical additives and preservatives. 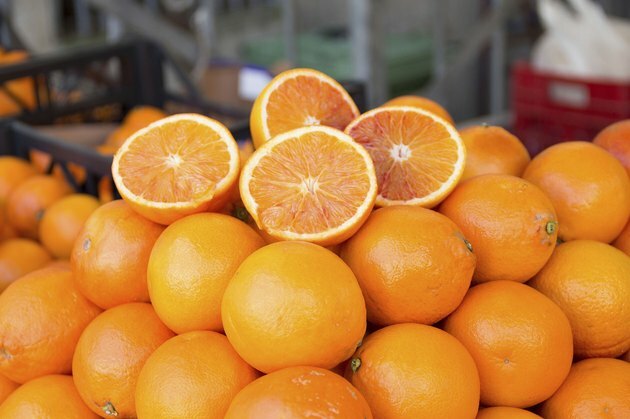 Oranges are very high in vitamin C and they also contain fiber. Vitamin C is a powerful antioxidant, meaning that it helps your body fight the damage to its DNA and RNA done by free radicals. Vitamin C is believed to support your immune system, though the Linus Pauling Institute cautions that more tests are needed to understand the exact mechanism for this. Fiber is necessary for healthy elimination, and while this will not aid your liver in any concrete way, it is good for supporting overall health. The benefit of eating oranges for liver health is that fruit is a healthier snack choice than chips, cookies or other mass-produced and overly processed foods. The only drawback is that oranges are not a magic bullet. You cannot overindulge in junk food and alcohol and then eat a few oranges to magically speed up your liver’s response.